THE SECRET INGREDIENT IS ALWAYS......LOVE. EACH INGREDIENT HAS A PURPOSE. INSPIRED BY VARIOUS AFRICAN TRADITIONS AND SUPPORTED BY SCIENTIFIC RESEARCH. This oil is high in antioxidants and OLEIC ACID (OMEGA 9) Because of the high levels of oleic acid, it is absorbed easily and quickly, this helps provide longer lasting hydration and better absorbance of nutrients. 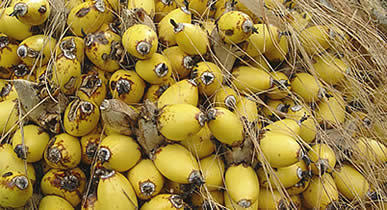 The SAW PALMETTO BERRY, a herb essential to hair growth (peret). Hair loss is linked to the conversion of the hormone; Testosterone into a molecule called DHT. DHT causes hair folliciles to thin over time, eventually eliminating them completely. Saw palmetto is a POWERFUL DHT BLOCKER. Some men have reported taking saw palmetto helps them regrow thicker, better hair. The “Tawira,” meaning People of Beautiful Hair have produced and used this oil for hundreds of years. From the Ojon trees that grow in the rainforest of the northern region of Honduras. BATANA gives your hair a thick, full body, heals damaged hair and reverses hair loss. BABASSU oil is rich in Vitamin E which is one of the primary nutrients needed to nourish Deeply moisturizing, Babassu oil is naturally anti-inflammatory and anti-microbial. NEEM is a a powerful herb! Loaded with antioxidant properties that can help speed up your hair growth and help fight against alopecia, male/female pattern baldness. Protect your scalp from dandruff, dryness, itch, scalp psoriasis, inflammation, and bacteria. LEMONGRASS essential oil has many healing properties, it works as an effective cleanser and deodorizer. It also can strengthen your hair follicles and soothe an itchy and irritated scalp. The refreshing, earthy, citrus scent is known to detoxify and reduce stress. Eliminate Sore, Itchy and inflamed Scalp Issues. CALENDULA is soothing to sensitive scalps, and is rich in minerals that protect the hair from free radicals, and the scalp from bacterial growth. Calendula oil also has regenerative properties. When applied to the scalp it promotes growth of stronger hair by increasing collagen production and circulation in hair follicles. CEDARWOOD is used to help stimulate the hair follicles by increasing circulation to the scalp. It can promote hair growth and slow hair loss; it can also treat thinning hair and various types of alopecia. Love, Coconut oil, Marula oil, Sunflower oil, Shea oil, Grapeseed oil, Castor oil, Orange oil, Golden Jojoba oil, Hempseed oil, Tea Tree oil, Peppermint oil, Babassu Oil, Saw Palmetto Berries, Horsetail Herb, Rosemary, Nettle, Calendula Flowers, Batana oil, Neem oil, Cedarwood oil, Lemongrass oil. A one of a kind hair growth oil that we can all use in confidence! This unique blend CANNOT be found anywhere else! This oil is a non-toxic, natural alternative for men, women and children of ALL ethnicities, handmade with LOVE and good intentions!